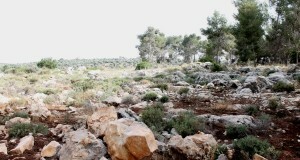 Several years ago the village of Izbit Tabib, east of Qalqiliya was served with demolition orders by the Israeli Army. The orders would mean destruction of 33 houses (73% of the village) and the village school. 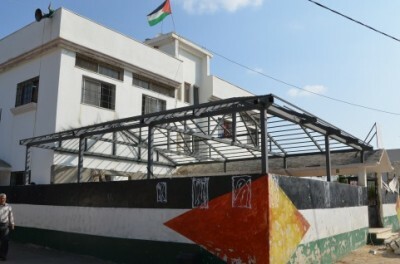 The school of Izbit Tabib (photo by ISM). 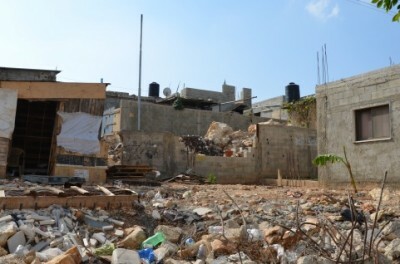 Two houses have already been demolished and the school which has 52 students is vital to the village and its future. 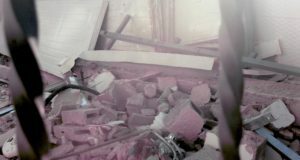 One of the demolished houses (photo by ISM). The villagers have been striving to get the order quashed in the Israeli courts, but the threat remains and hangs over the village like a black cloud. Yesterday the villagers organised a demonstration against the threat and were supported by representatives of the Palestinian Authority, groups of international activists, Israeli activists and a TV camera team. 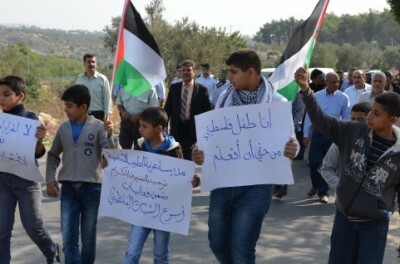 The school children joined the protest and made several speeches. The protest march (photo by ISM). Trees were planted at the site of a proposed new school and the demonstrators then marched into the village with banners flying and heard speeches condemning the Israeli army’s intended action.